My only real complaint about Kinsman’s Tree [book 1—free] was that it was a pre-messiah spirituality. 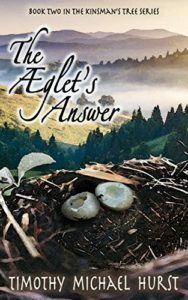 Tim Hurst spirit-filled fiction Æglet’s Answer fulfills my hope—better than I could have imagined. 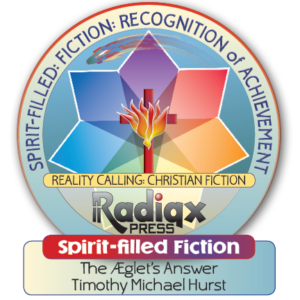 In a bold move, he has taken a wonderful, highly imaginative fantasy into an edifying look at how walking in the Spirit really works. In doing so, he gracefully avoids the normal conflicts and barriers surrounding Holy Spirit empowered Christianity. He did it by inventing a fictional spiritual reality which still rings with truth. The Redemption story is quite different but directly tied to Truth and Reality. 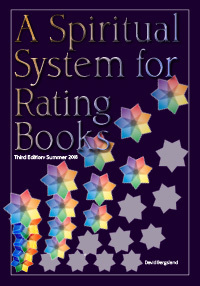 This is my first 5-star rating in quite a while. The book is that good. Yet, it remains deeply creative and unique. He adds nice little twists like talking with animals and between races far more different than leprechauns and humans. We all take that as sheer fantasy. Yet, the Jewish rabbis talk about humans talking with animals until that was cut off when we were expelled from Eden. These factors go beyond the suspension of disbelief into a deeper understanding of the wonders designed by our Creator. This story demonstrates exceptional world-building like I’ve never seen—because of the clear presentation of spiritual reality. Of course, we gave it a spirit-filled fiction award. Peter’s review gives a spectacularly complete analysis, as usual. But, I want to go beyond what we usually do in our reviews. This book needs your help. This level of Christian fiction remains exceedingly rare. I imagine much of its impact will be found in church members who have never heard about this level of Christian living. Sadly, the church in the US has devolved into ear-ticklers in many cases. My heart goes out to people in the pews of those churches who have actually never heard the Gospel and wouldn’t even know where to look to find out. Please buy a copy and read it! Then share it with your friends, talk it up, give the book a solid review, and pray for Timothy and his wife [who are relatively new in full-time ministry, if I understand correctly]. This young man and their family have great potential. The Body of Christ needs books like this to help bring in the harvest—and more importantly, encourage and bless the saints. More than that: if you can help us promote books and authors like Tim and many others, please make suggestions, pray for us, and join us in the fight. Because you can be sure, the enemy doesn’t like stories like this at all. Redemptive and spirit-filled tales are needed at a time like this. Thankfully, more and more authors are stepping up to the plate. Help us encourage them, promote them, talk about them, and pray for them each individually when you discover a work of this spiritual quality.